1 What do you think of when you hear the bagpipes? Maybe you think of Scotland or England. Those countries are known for their bagpipe music. However, forms of bagpipes have been around for centuries. Many ancient civilizations had a "pipe with bag." Art from Egypt, Greece, and Rome shows early forms of bagpipes being played. 2 Bagpipes were popular in Europe between 900 A.D. and 1500 A.D. However, they lost favor to more portable instruments as cities developed on the continent. The exception to this is the British Isles. Today, bagpipes are a part of the British culture, especially in Scotland. 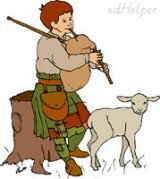 3 Much of the history of bagpipes is myth. One story says that bagpipes were considered an instrument of war. After the English defeated the Scots in 1745, it is said that Highlanders were forbidden to use the bagpipes. However, they were used in secret in defiance of the law. This legend earned the bagpipes the title of "Great Highland Warpipes."